Squawk Valley resident will be without a turkey for Thanksgiving unless they come up with a plan to lure a turkey to town. They come up with a doozy—a turkey-themed art fair that requires a real-life model to pose for the sculptures. Posters go up throughout the forest, and cocky, clever Pete signs on for the job. On Thanksgiving Day, the townsfolk are ready to drop the pretense and pop Peter in a pot, but he has wisely flown the coop. The longish text is in rhyme, but it scans remarkably well, using wordplay to highlight the humor. The illustrations, in autumn hues and executed in gouache and watercolor, are at their best whenever plump, perky (and perceptive) Pete is on view. 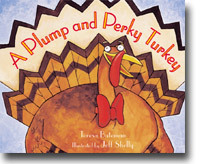 In this rhyming story, Pete, a turkey outsmarts the townsfolk of old-time Squawk Valley as they mask their quest for a Thanksgiving entrée with the premise of needing a feathered model for a themed arts-and-crafts fair. Angular cartoon people, done in watercolor and gouache, create turkey sculptures of potatoes, rope, oatmeal, and soap, as well as collages and portraits. The final page showing a dozen turkeys at the beach is a real champion, capturing various comical expressions and activities. An interactive Web site with games and activities offers entertaining follow-up. The leaves have changed, Thanksgiving nears—and the canny turkeys of Squawk Valley have decamped, leaving local residents to face the prospect of a birdless holiday. What to do? They decide to lure a bird back by appealing to its vanity, placing a want ad for a model to help sculptors creating turkey art, then ‘inviting' the bird to dinner. Their ploy works, too, for out of the woods struts plump and perky Pete to take on the job. Shelly debuts with brightly hued cartoon scenes featuring pop-eyed country folk and deceptively silly-looking gobblers. Peter may be vain, but he hasn't lost the wiliness of his wild ancestors; when the townsfolk come for him, he hides amidst a flock of sculpted gobblers… Good for a few giggles.